Two years ago I developed a software app called SkySaw for use on my teaching shift at the COEGM. SkySaw allows clinicians to structure patient encounters as a linked network (technically a directed acyclic graph). What made this attractive was that these individual networks could be connected together into a great network. One could then use graphing tools to data-mine relationships, trends and outcomes. As the first stage of Opus23 Pro moves to completion, I decided to port this app over to Opus. What follows is the online doc file for PROTO, the Opus 23 app. 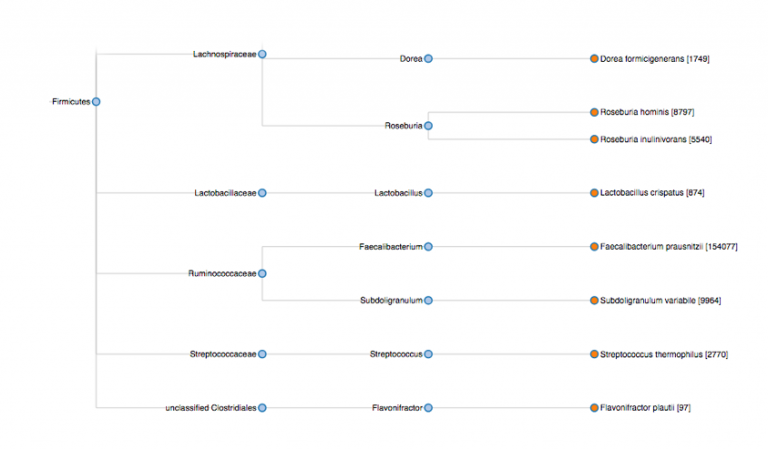 PROTO allows you to develop a flow-chart (network) based approach to health protocol management. Creating a protocol network in PROTO is easy. Protocols can then be added to the client report, allowing for a more client-friendly way of relating your clinical decisions. Reset the screen: Ticking this will reset the screen and zoom level. You can zoom in and out by using the scroll function of your mouse. You can move the network around by click-grabbing the network and moving your mouse. Add a new node (plus sign): Ticking this will launch a popup window that allows you to add a new node to the network. You then give the node a name and a type (food, drug, molecular target, lab test, etc.) and if you wish provide a short bit of accompanying text. Add a new edge (two connected nodes): Ticking this will launch a popup window that allows you to add a new edge to the network. Edges connect nodes. The input fields will autosuggest nodes to use based on the existing nodes in the network. Info screen: Ticking this will launch this popup window. Editing nodes and edges: You can edit any node of edge in the map by clicking on it. This will launch the appropriate popup that will be populated with the existing data. You can make any changes and then save. Map direction: The map is designed to proceed in its development from left to right. will add that gene to the current protocol as a ‘molecular target’ node. I designed Opus 23 Pro to serve two user audiences: the physician who works in the development environment to generate and curate information; and the client, who represents the end-user of that information. Both have widely differing needs and points of reference. One aspect of Opus 23 Pro that I am especially proud of is the great lengths the program goes to to make its final product (the Client Report) simple, concise and easy to understand. One area that has an especially interesting and dynamic quality is the way that Opus 23 explains the actions and consequences of genes to the client. 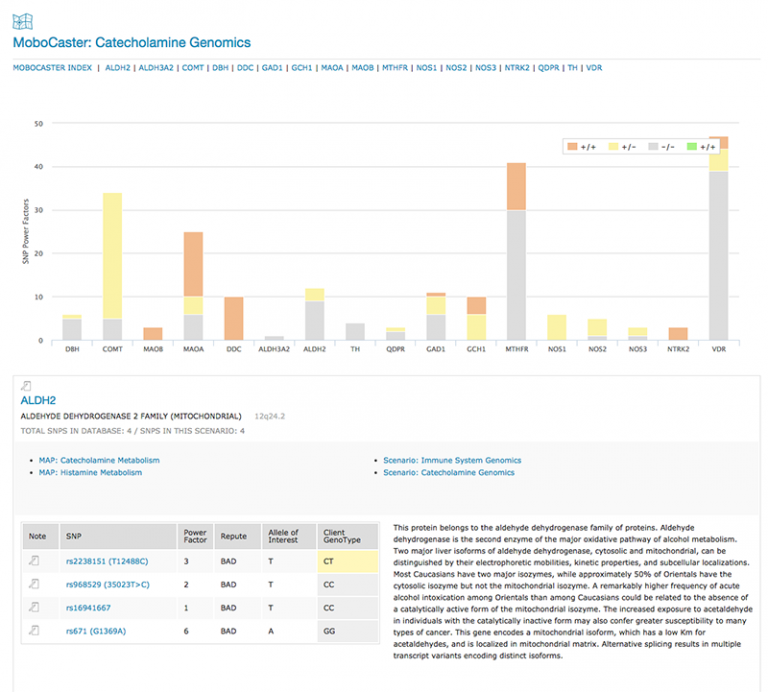 Opus 23 Pro aggregates much of its data from public, peer-reviewed sources. This includes the descriptive text that accompanies information about genes. Typically Opus 23 grabs this information from genome.gov. However these short abstracts are often highly technical and cryptic -very unlikely to be very helpful to a patient who does not have a background in genetics. So we created an alternate database of gene descriptions specifically written for the layperson, which is used when Opus 23 Pro generates the client report. However, even simplified gene descriptions can be somewhat technical and often rely on the reader having some form of base knowledge. Here is a nice touch you don’t see very often. When Opus prints out the gene description in the client report it checks its internal glossary for any advanced medical concepts and if they are in the description the ‘smart owl’ will activate and give the client a simple description of the term. To avoid repeating itself endlessly, Opus only adds the glossary description to the first description that requires it. In this screen shot it is explaining what the terms ‘gene,’ ‘interleukin,’ cytokine and ‘protein’ mean. Algorithms are perhaps the most significant and flexible aspect of Opus 23 data. They are usually the easiest result for the non-medical person to understand, because their conclusions are usually simplified statements in everyday language. Algorithms are processed by the LUMEN app in Opus 23 Pro. LUMEN is one of the most powerful apps in the Opus 23 Pro toolbox. 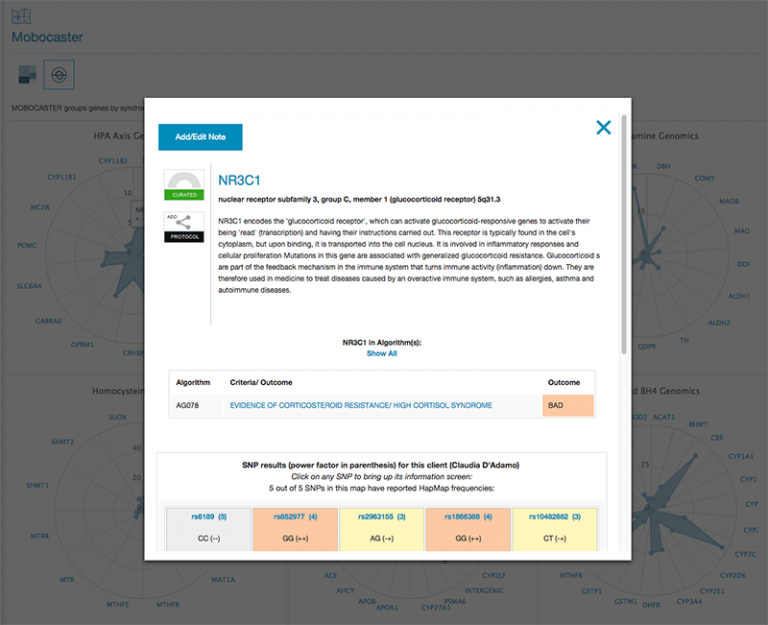 This app allows you to examine the effects of multi-SNP, multi-gene consequences. Very few single SNPs exert their effects independently; they more typically interact through epistatic relationships (where the phenotypic expression of one gene influences the genotypic expression of another) or as a haplotype: a set of several SNPs, on a single chromatid of a chromosome pair that are associated statistically. LUMEN does this by using algorithms, small step by step programs that run inside of LUMEN and that look at the logical result of multi-SNP combinations. This type of logic is essentially ‘Boolean’ in that its queries yield a yes or no answer. The combination of both allows LUMEN to provide you with insight into complex SNP arrangements and relationships that might otherwise escape detection. It’s helpful to think of an Opus 23 algorithm as a tiny flowchart, that depending on which way the result branches, generates a ‘true or false’ result. If you hear the alarm clock, open your eyes. If it’s dark outside, go back to bed. If it’s light outside, check the time. If it’s earlier than 7AM, go back to bed. If it’s Saturday, go back to bed. As can be seen, there are a lot of ways you can go back to bed with this algorithm! And this is also true as well for the Opus 23 Pro algorithms: In order for an algorithm to be true, it must fufill all of several conditions. If even one condition fails, the whole algorithm will be false. An algorithm that returns a true will have a ‘check’ icon in the bottom left-hand box. The conclusions of these algorithms pertain to to the client based on their genomic data results. An algorithm that returns a false will have a ‘cross’ icon in the bottom left-hand box. The conclusions of these algorithms do not pertain to the client based on their genomic data, other than perhaps the added knowledge that this is one less thing in life to worry about. 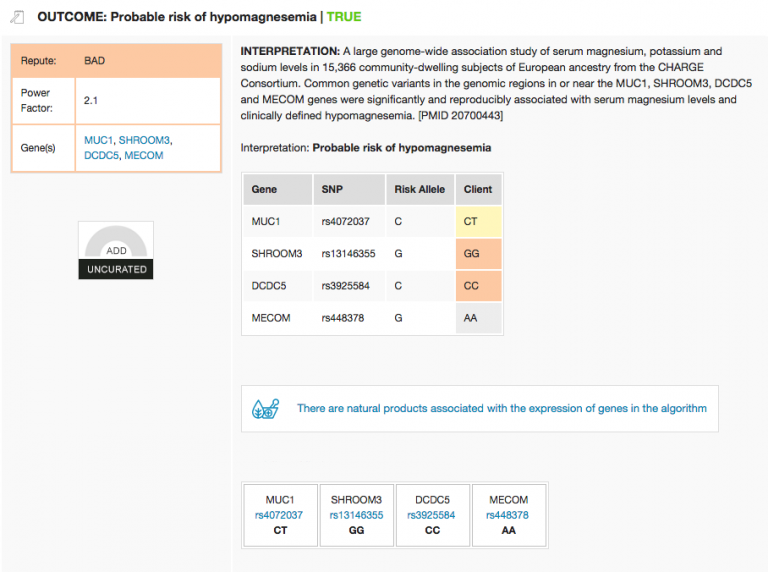 Opus 23 algorithm triangulates four genes/ 6 snps to estimate genomic variation in serum magnesium levels.